There are very few games I've ever played where I have said to myself, "yes, this should be free." Because, let's be honest, when you work on a project, you expect there to be some reward—financial, preferably—at the end. You probably think, and rightfully so, that implying Smite (or any other video game) has no value is a terrible—perhaps even offensive—statement to make. So let's back up a little bit, and I'll explain what I mean. The game is pitched—and I'm copying this from Hi-Rez Studios' website—as "an online battleground where the Gods of Old wage war in the name of conquest, glory, and most of all, FUN." Yet Smite is anything but fun. In fact, the game manages to take an epic concept and realize it in what is perhaps the most boring way imaginable. What went wrong? From the very first moment you start the opening tutorial, it becomes readily apparent that the game is simply a third-person brawler with incessant mini-boss battles (in the form of other gods). You can sort of crush your opponent's minions... but not really all that well considering, you know, you're supposed to be a god. It's kind of pathetic to see Zeus get pummeled by a mortal while Osiris flails away with an ankh that has a set of ticklers glued onto the end (see above picture). Yes, you can level up your god and, as you earn money, buy traits that increase your health, your attack speed, your defense, your damage, etc. But... what's really the point? I'm still going to tape the right trigger down so my character can spend three minutes hacking away at Hercules, only to be killed by a mortal's seemingly laser-guided bow and arrow. There are some games that do computer controlled opponents correctly. Titanfall—whose minion bots are easily crushed, but can be overwhelming if they attack in coordination with other players—springs immediately to mind. Smite, however, is not such a game. And, yes, I know what you're going to say: "Smite isn't about fighting bots, it's about competing with other people." I realize that. I'm utilizing it as a singular example of one of the ways in which this game utterly fails to be interesting. Because a lot of the same problems that are exposed fighting bots—my biggest complaint being that the game is simply boring—carries over to fighting other real life players, too. Okay, so we've established that combat is boring and consists solely of holding down the right trigger whilst generally facing in the direction of your target. How about special abilities? Those should be epic, right? I mean, after all, this is a game about a war amongst gods. Well, I'm sorry to disappoint you. 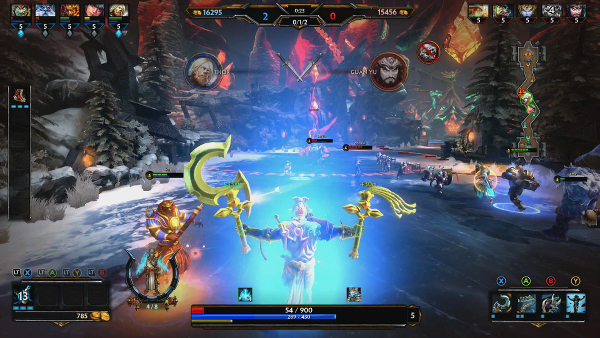 While some of the abilities sound cool in theory—Ymir can throw up an ice wall to block attacks, for example; Osiris can summon the dead to reach up through the ground and grab enemies within a defined area; Ratatoskr can throw four acorns in a cone, damaging any enemies within the attack's range and radius—they generally fall flat in execution. I want to see Ymir's ice wall split the ground and explode out through the map; I want to see Ra's Hammer of Dawn-style (for you Gears of War fans) solar-beam attack tear scorched chunks out of the ground. But I realize, realistically speaking, those might be a little too hard for the developers to accomplish on a console system. After all, during my playthroughs, it frequently takes over a second for detailed texturing to pop in when you're standing ten feet away from, and staring directly at, in-world objects like... walls. If the team can't even get static objects to render fully until you're right on top of them, then I admit I don't know how they'd ever cope with detailed, real-time dynamic map effects. Now, I understand this isn't a Triple-A console game. And I understand the difference between 'realistic' graphics and 'stylized' graphics. But the visuals in this game are just flat. For a game that takes its inspiration from classical Greco-Roman mythology, from Hinduism, Ancient China, Norse legends, and Mayan religion, why does everything look so uninspired? Why do all the characters look like something out of Western animation? I mean, come on, each of those cultures have thousands of years of art and architecture... the art team could at least have tried to make the characters stylistically stand out from each other a little bit. In fact, the only characters that actually stand out are Ratatoskr (because he's a squirrel), Cupid, and Scylla, the latter two of which are drawn in more of an anime-style. At first, the controls seem fairly intuitive. With the exception of clicking the right thumbstick to jump (which is effectively useless anyway: deities are apparently only capable of jumping about six inches into the air), the controls are really easy to learn. Your left thumbstick controls movement; right thumbstick controls your camera. Right trigger is used to attack; special attacks are mapped to X, A, Y, and B. Your special buffs are mapped to Left Trigger + X, LT + A, LT + Y, and LT + B. Now, the question I have is... why? The left and right bumper buttons seem to do nothing, so why aren't they used to cycle between primary (offensive) and secondary (defensive) abilities? The Left Trigger could then be used for a secondary attack—or really just anything to relieve the monotony of gripping the Right Trigger as tight as possible and watching your character do the same repetitive animations over and over again. And... 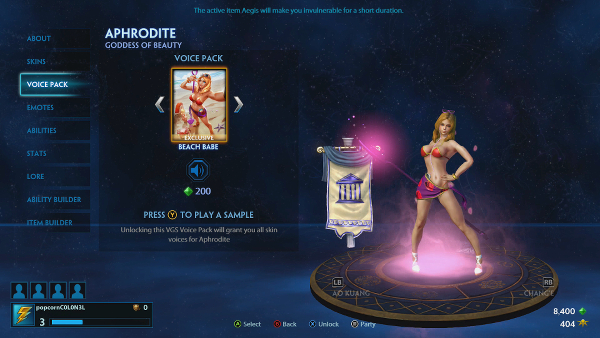 I'm not sure why, but Aphrodite is secretly a Cali girl, bouncing around in a bikini. "Did you see that? Oh Em Gee!" or perhaps "That's so hawt!" is more your style. And, yes, those are both (unfortunately) lines of dialogue in the game. 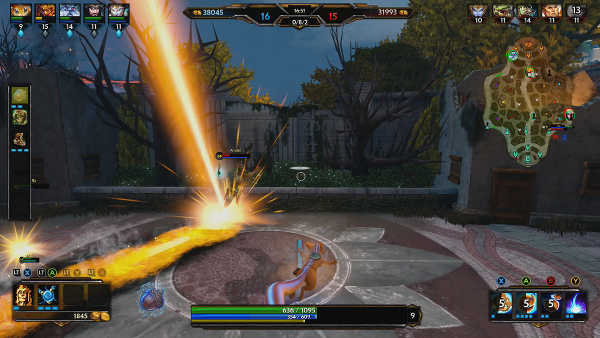 Okay, so, when I said that Smite should be free, I didn't mean to say that it is terrible. What I meant is that the game honestly just isn't all that good. But I can play as the main character from Conker's Bad Fur Day, though... so that's something, at least. I don't think I ever won a single fight in Soulcalibur II. Thankfully, I'm marginally better at reviewing than I am at fighting games. "Go to Thugtown" is apparently the best reason the development team could come up with as an excuse to shoot at zombies. There is little margin for playing around to find what works, and what doesn't, and there's certainly no room for 'fun.' In fact, as much as I hate to say it, the hardest challenge in this game is forcing yourself to try and keep playing it. If you haven't played World of Tanks, you've been missing out on one of the best free-to-play games to be released in the past five years. And if you somehow managed to get this far into the game, maybe you also noticed the graphical glitch where your sword flies six feet off to your side when you run. (And, no, it's not an intentional animation.) Given how disappointingly underwhelming this game is, and how much is locked behind pay-walls and ZEN points (Neverwinter's arbitrary currency purchased with real-world money), I pretty quickly decided to play something else. Sniper Elite III is a fun game, but it is not necessarily a great one. While the killcam is a unique feature, and it can be sadistically entertaining to watch bullets tear through your enemies, it is really the only thing that separates the game from other generic third person shooters. The open level design and optional objectives allow room for tactical planning and freedom to accomplish your mission in whatever way you see fit, but wonky A.I. and uninspired shooting mechanics can ruin a good run. It's worth the price tag for the borderline ridiculous long-range shots you can pull off, but the campaign isn't so good that I'd want to play through it a second time right away.